Having long admired the Pottertons Nursery displays and plants at flower shows, I finally got to visit their garden and nursery on the weekend. It coincided with a Plant Hunters Fair taking place on site, which was perfect as there are some new plants I was after for my new garden. As as bonus, I was able to order some red Heleniums I was after from Martin of Special Perennials (who also organises these plant fairs), to pick up on the day. 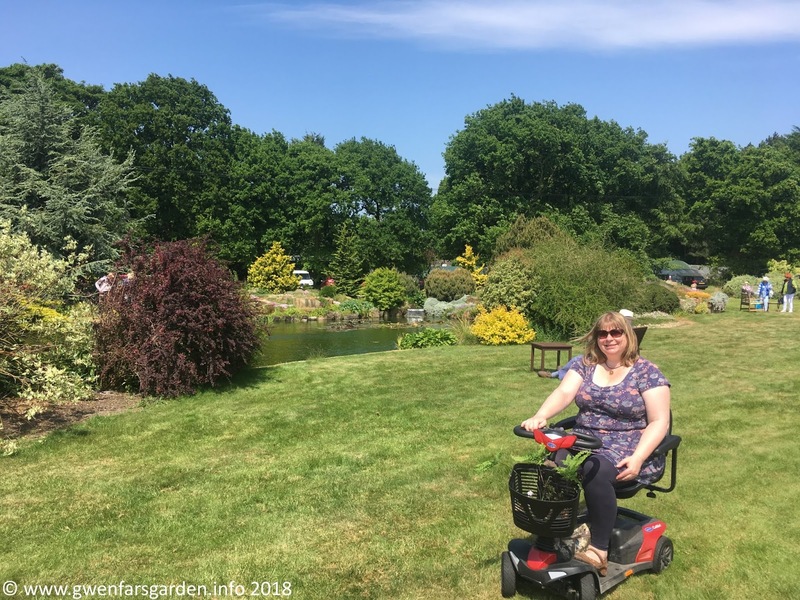 This is a write up of both the fair and Pottertons. As someone not well enough to currently attend the larger flower shows, plant fairs are an ideal way of getting some of the flower show bling without the crowds and expensive food prices. I checked in advance that I could use my mobility scooter, and yes, no problem. 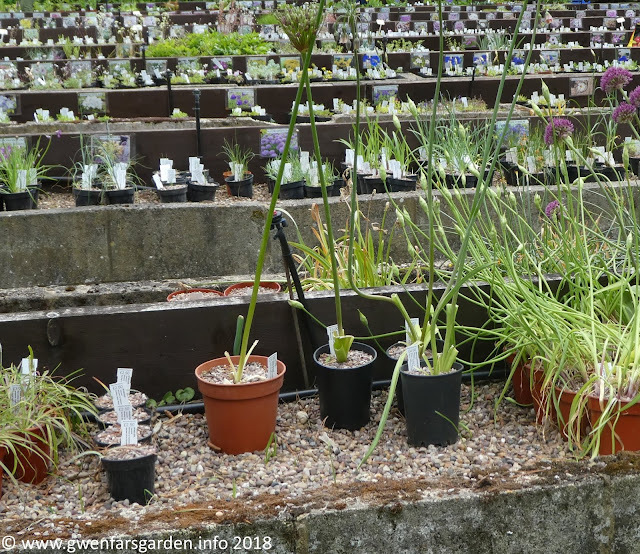 There were 10 nurseries spread out across the large garden, including Edrom Nurseries from Berwickshire, Jurassicplants Nurseries from Denbighshire, Tissington Nursery from the Peak District, and Special Perennials from Cheshire. A good opportunity to see the plants available from nurseries that I couldn't usually get to. 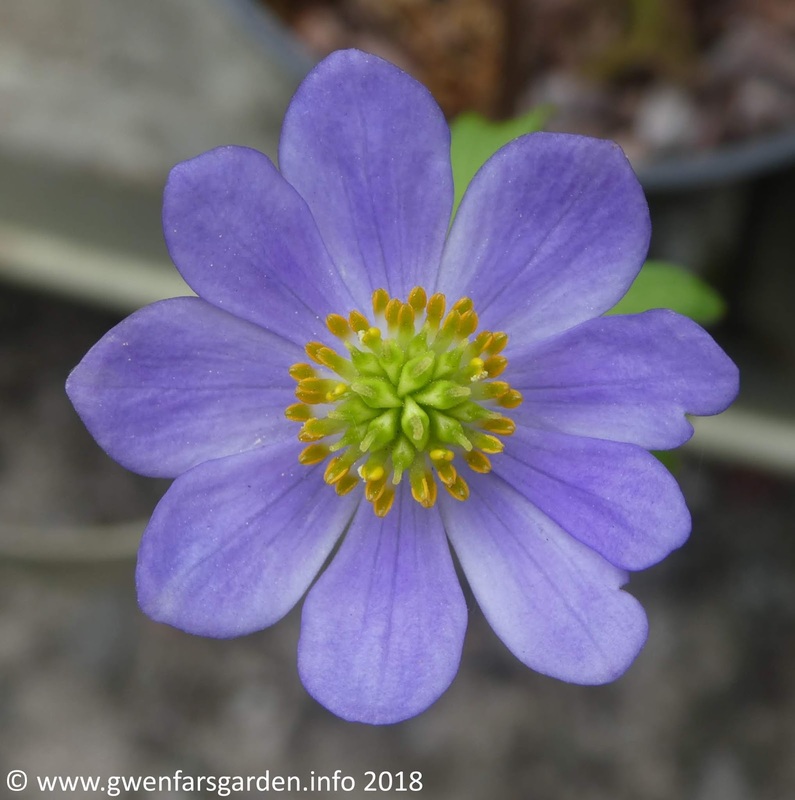 I've purchased Hepatica's from Edrom in the past, and I was told they will have even more Hepatica's in their catalogue this autumn. Oooh! 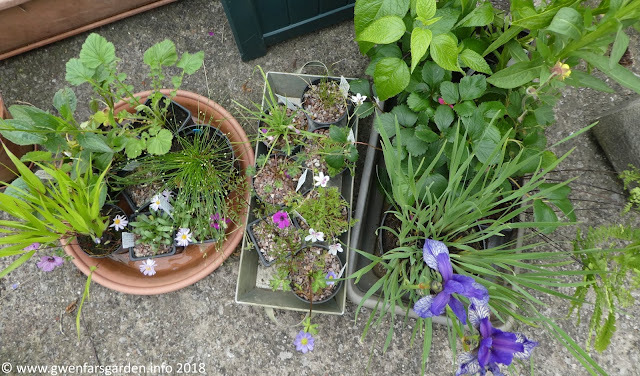 This time I picked up a trailing Clematis, C. x Eleanor, Allium insubricum and a couple of Erigeron leiomeris. 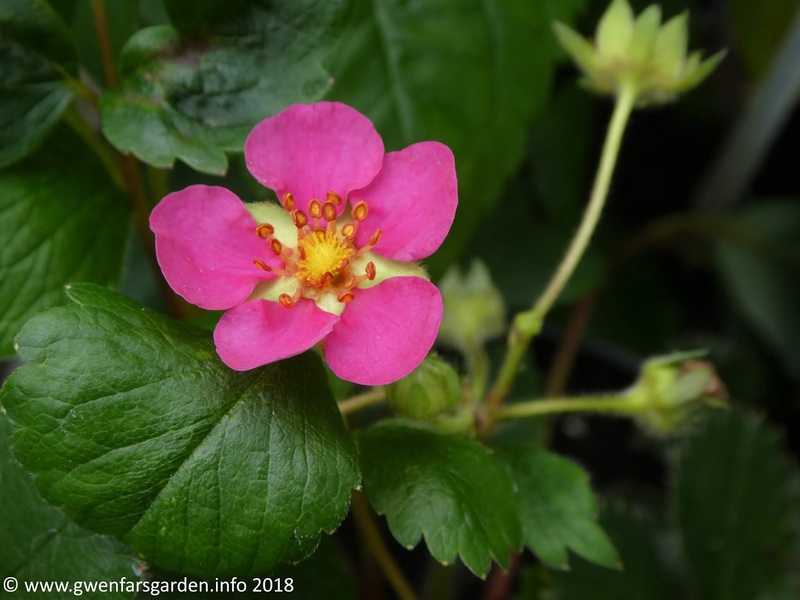 I want to start a new strawberry patch and having seen a pretty pink flowered strawberry on The Cynical Gardener's website a couple of weeks ago, I was on the look out for something similar. So when I saw Fragaria red ruby at the Mayfields Plants stand, I excitedly grabbed one. It's smaller fruits are supposed to fruit from May to November, and I look forward to trying some soon. 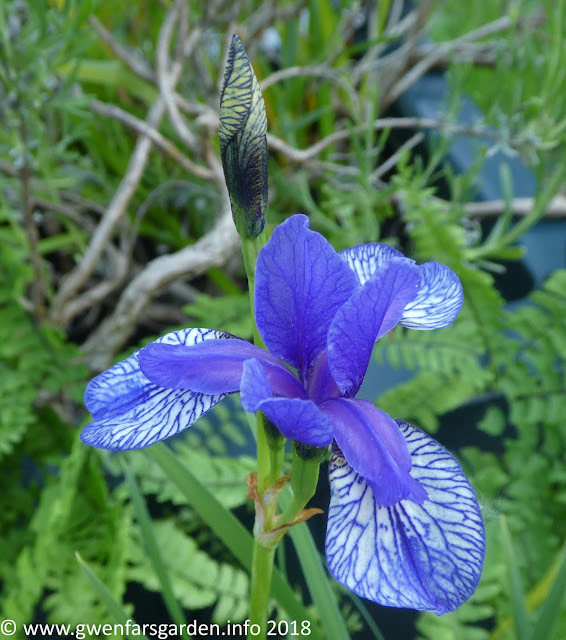 Kevin chose this beautiful Iris, I. sibirica 'Flight of Butterflies' from The Gobbett nursery. And I purchased three red Helenium's from Special Perennials, including H. Waltraut and H. Dark Beauty. They aren't flowering yet, but from photos on their website, they look nice and hot for my new 'hot garden' (hot colours, that is) at the front of the house. 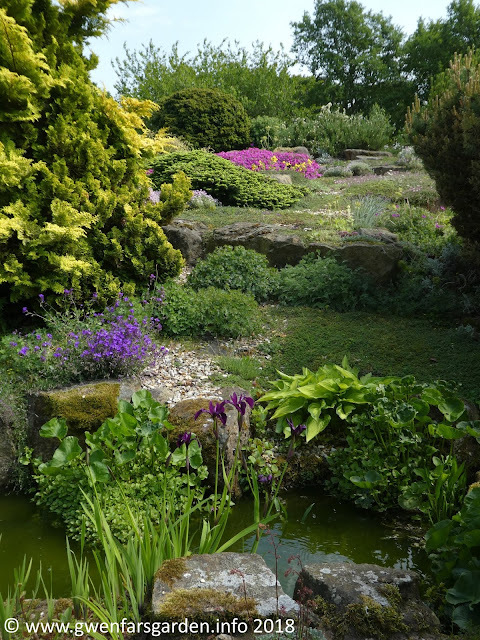 Potterton's is a specialist nursery focusing on selling alpines, dwarf bulbs and woodland plants. 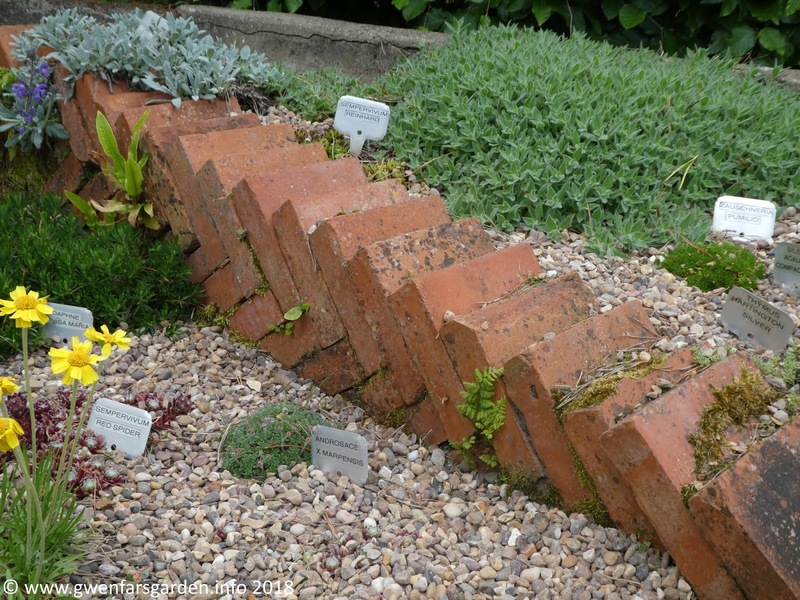 And wow, does the garden accompanying their nursery sell their plants for them. 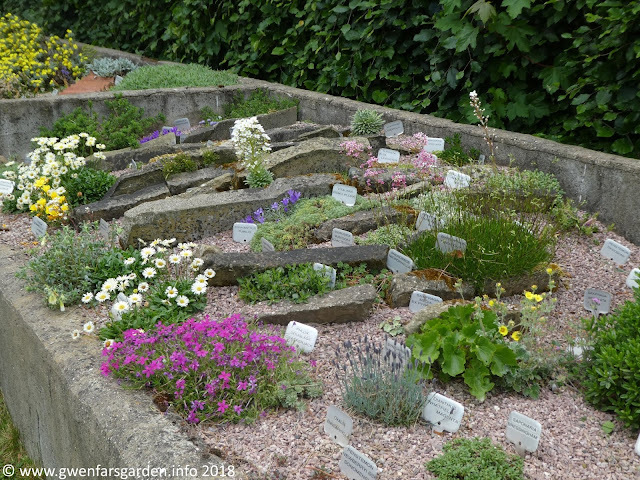 Who wouldn't love alpines after seeing this?! 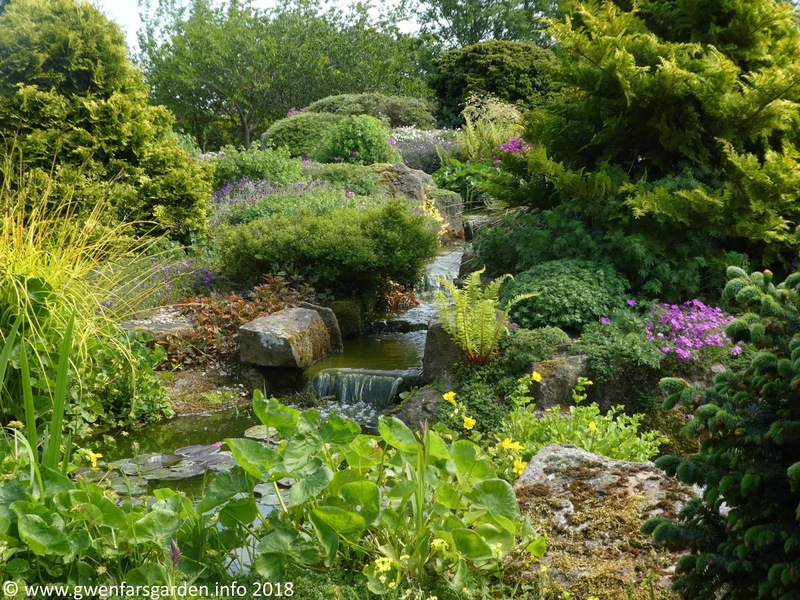 Because the garden was also open as part of the NGS, this included 'Mum's Garden', which is over closer to the nursery itself and I think not always opened to the public. 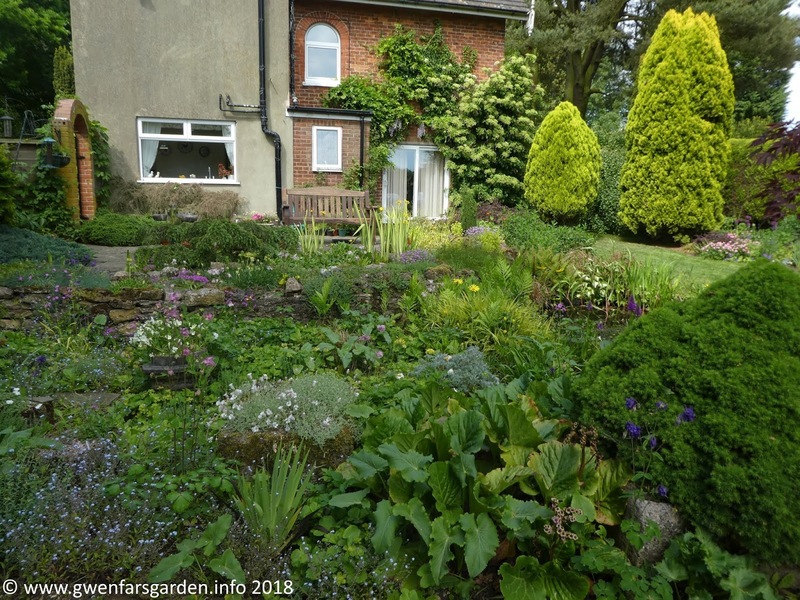 It was a classic cottage garden and Kevin and I both declared that we wanted to live there. The nursery was also navigable for mobility scooters and wheelchairs (possibly not the larger mobility scooters though). There was just so much available and I'll be honest and say that I didn't, on this occasion, go down every row, as ME* exhaustion was taking over. 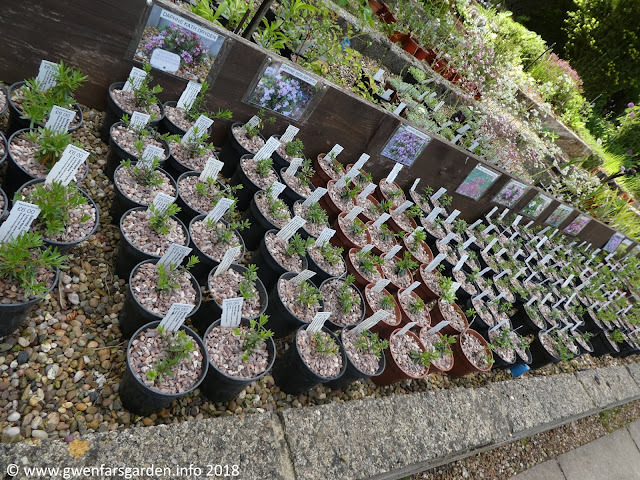 However, I discovered that they had a fine collection of alpine Daphnes, and I'll be definitely returning to purchase some in the future. The nursery was clearly laid out and oh so organised. I love an organised nursery. I also picked up some display ideas, including this excellent use of paving stones to create a border and height. We inherited a large number of grey ones with our new home, and I don't need that many paths. Now I have an idea of what to do with the rest. 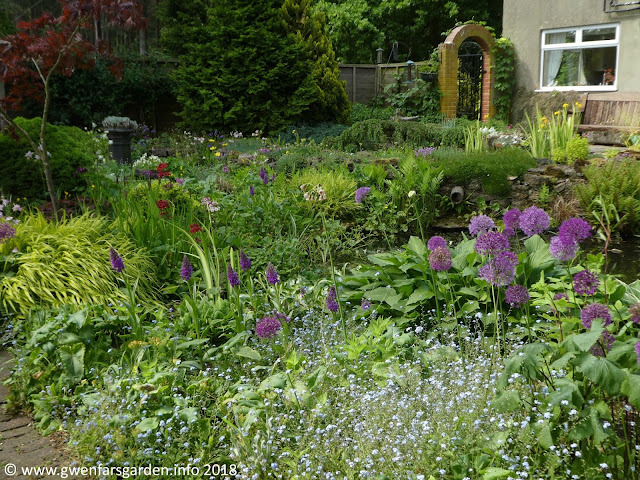 Visiting both the plant fair as well as the garden and nursery was a great pleasure. I picked up lots of pretties and enjoyed chatting to the nursery people. Everything, both the nursery and plant fair, was well organised. The obligatory, and tasty, tea and cake, allowed you have enjoy a break in between all the oohing and ahhing over plants. And gave you time to ponder on whether you should just quickly go back and pick up that other plant you liked. You know the one. Yes, you should definitely go and pick that one up too. I plan on visiting Pottertons again (and again). They have a wonderful selection of alpines, and all the plants I purchased looked to be in very good health. 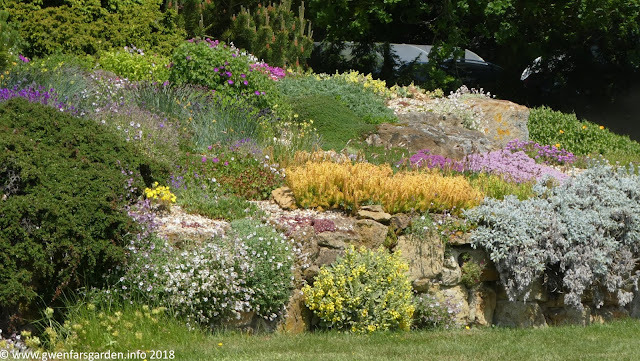 It was also inspiring to be able to view plants in situ, and also really helpful when forming your plans for alpine displays at home. 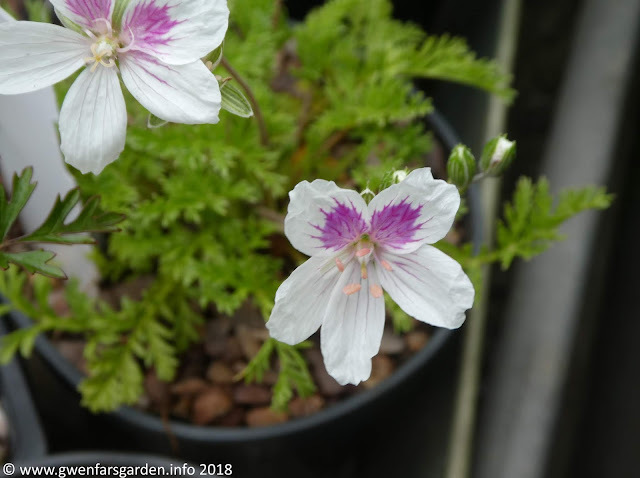 Visit the Plant Hunter Fairs website for a list of upcoming events. Pottertons will be having an open day on Saturday 15th September, 10am-4pm. 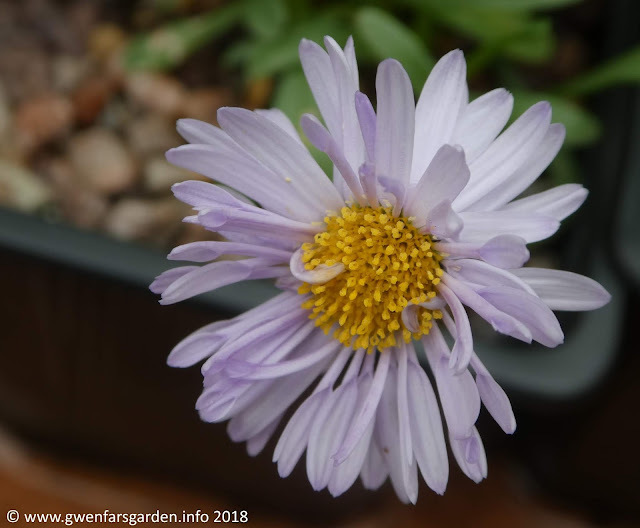 They also have a list on their website listing the flower shows and events they will be attending coming up. Right: In front of the large pond. Have scooter, will buy plants. And more plants. All the plants. *ME - the chronic illness Myalgic encephalomyelitis, known as ME. Looks like the sort of place that I would like and where I would spend a fair amount on plants.